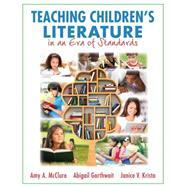 by McClure, Amy A.; Garthwait, Abigail V; Kristo, Janice V.
Teaching Children’s Literature in an Era of Standards presents a realistic, positive, and proactive approach to using the Common Core State Standards (CCSS) and 21st Century Learning Standards as the basis for teaching children’s literature in kindergarten through eighth grade, addressing the caveats and issues involved in implementing the standards. This new text encourages teachers to value children’s books for both enjoyment and learning, suggests teaching strategies matched to the specific grade levels and skills defined by the CCSS, and provides examples of excellent children’s books as resources. Suggestions and advice for integrating new technologies into children’s literature instruction are emphasized in conjunction with traditional teaching methods. Topics include responses to literature, teaching strategies for the focused use of children’s books, supporting literacy development, fostering a love of reading, and chapters devoted to the major forms and genres of children’s literature: picture books, poetry, traditional literature, fantasy and science fiction, contemporary realistic fiction, historical fiction, and nonfiction. Amy McClure is the Roderfer Endowed Professor of Education at Ohio Wesleyan University where she has taught courses in children’s literature and literacy for over thirty years while also directing the university’s Honors Program. She is a co- author of Living Literature and Sunrises and Songs as well as editor for several books and author of numerous articles. Dr. McClure is the past president of the Children’s Literature Assembly, Children’s Literature and Reading SIG, Ohio Council of the International Reading Association, and President Elect of the Ohio Association of Teacher Educators. She has served on numerous book award committees, most notably the 2013 Newbery Medal Committee. Janice V. Kristo serves as Associate Dean and a professor of literacy at the University of Maine. She is a co-author of Living Literature as well as several edited texts about sharing literature in the K-8 classroom. She is particularly interested in nonfiction; she has numerous publications focused on nonfiction as a genre as well as ways to teach children how to read and write nonfiction. Abigail Garthwait teaches graduate courses in instructional technology at the University of Maine. She has also taught young adult and children's literature classes for the past eight years. She is a co-author of Living Literature and has published articles in research journals about computer and technology use.